Y'know when you find a few products that just rock your world? Well that's me right now. I can't wait to get these on my head each day so it's only fair that I share them over here too, since it's a been a while since my last haircare update post. Have you got flyaway hairs and want your hair to smell like a dream? Then Toni & Guy have your back. A 50ml tube will set you back £10.99 in Superdrug but if you're a tightarse like myself, you can pop along to your local POUNDLAND and stock up in there right now, ohh yes! I initially bought this product to use on the ends of my hair but it's designed to be used all over to help fight frizz, enhance natural movement and shine without feeling heavy or greasy. 2 pumps through lengths and ends of your hair and you're done. It also has a built in UV filter too and as a bright haired lady, I appreciate this very much, as the sun and UV rays kill coloured hair. This is one to stock up on now! I'm pretty new to Percy & Reed haircare products but these two have quickly become favourites in my daily routine. I use a spot of the Percy & Reed Wonder balm on damp hair and it's just as if it makes styling easier. My hair, only better, y'know? Wonder balm is a primer for your hair. I know what you're thinking but it works. 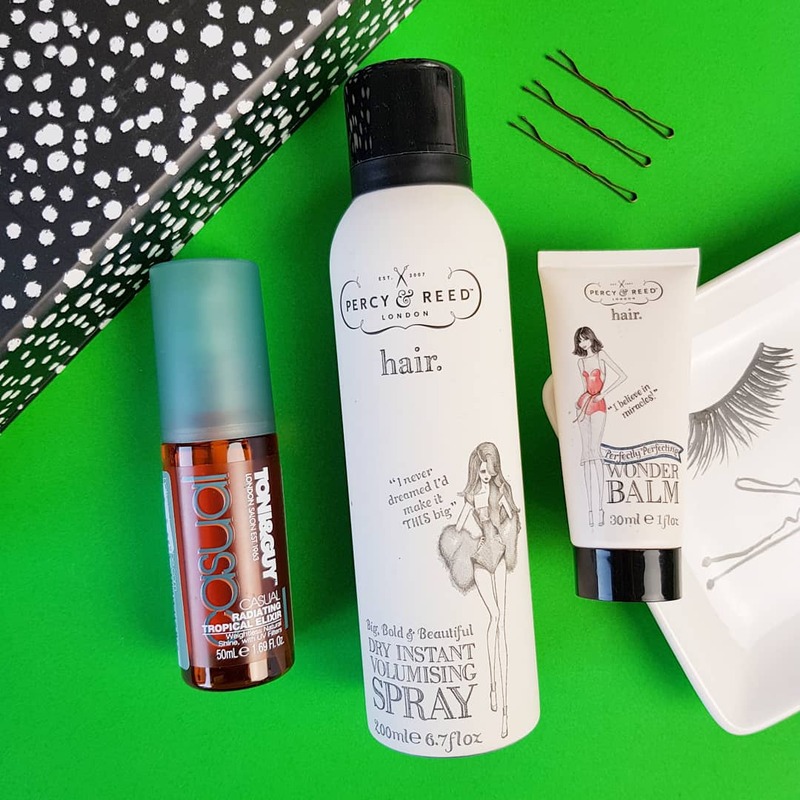 No matter how I want to style my hair, if I use the Wonder Balm before drying, my hair just feels easier to work with, does what I want and seems to help my styling last all day. Have you tried the Percy & Reed Dry Instant Volumising Spray yet? It's non sticky, does what it says on the tin; kinda like dry shampoo without the white cloud but helps my fringe stay in place like magic. This product works best for me right after drying. When you have a fringe, freshly washed hair can be a bit of a nightmare, it's too soft to style so teaming these two Percy & Reed products together has given me a happy head recently. Have you discovered any new haircare products recently? I'm thinking of doing a full in-depth post about how I care for my colour treated hair soon as it's something I get asked a lot. Do you have issues styling your hair or keeping your colour fresh?